Start here Fundcraft Publishing. This option is where Fundcraft Publishing types your cookbooks. Or your may opt to use the Short/Cut™ Online typing program from Fundcraft. 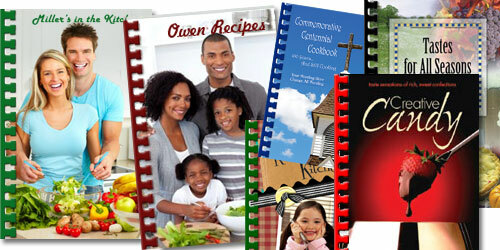 A cookbook/book publisher for over 75 years with success in fundraising cookbooks. Fundcraft Publishing will type and proof your recipes for you! Just collect the recipes, sort them into sections, place them in your desired order and Fundcraft will do the rest! After Fundcraft typesets your recipes, we will proofread them against your original copies to check for accuracy. Cookbook publishing production time is 35-50 working days if Fundcraft types your recipes. Success in this fundraising program has a fundraising guarantee. Fundcraft provides a online proof copy for 5 days, allowing you to print a copy of your book to check before the production. During the proofing stage, Fundcraft errors will be corrected at no charge, any changes from the originally submitted materials are subject to an additional charge. Hard copy proof is an additional charge. Start here CookinUpFunds. This option is the CookinUpFunds program. This is an easy fundraising program for students. 1) Make your selections from the catalog and complete the order form below, in PDF format. If you have selected any of the One Photo Fun Gifts, attach your presonalized caption and photo to the the order form.